Want a quick way to update a kitchen or a bathroom? 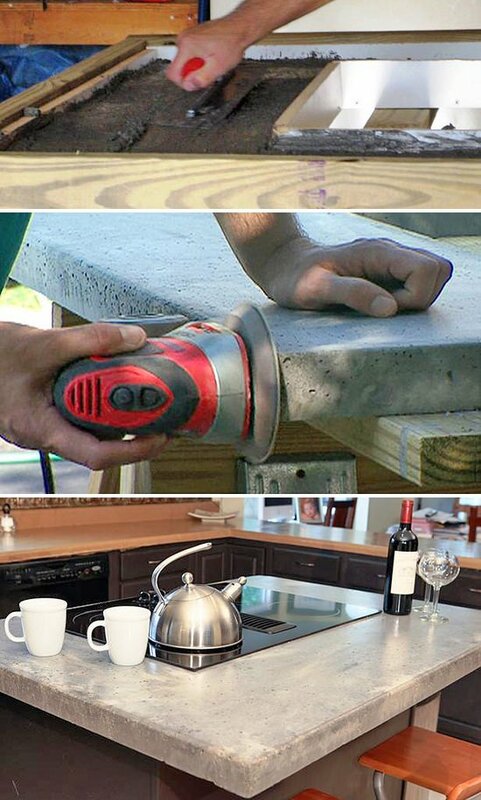 Update those old countertops! Nothing dates a room faster than old tile or laminate, and with these DIY countertop ideas & projects, you don’t have to settle any more! These tutorials will have you bringing out the best in your hardest working rooms in the house. From the days when I first started ‘The Budget Decorator‘, I have been a fan of using paint where no man (or woman) has taken it before. 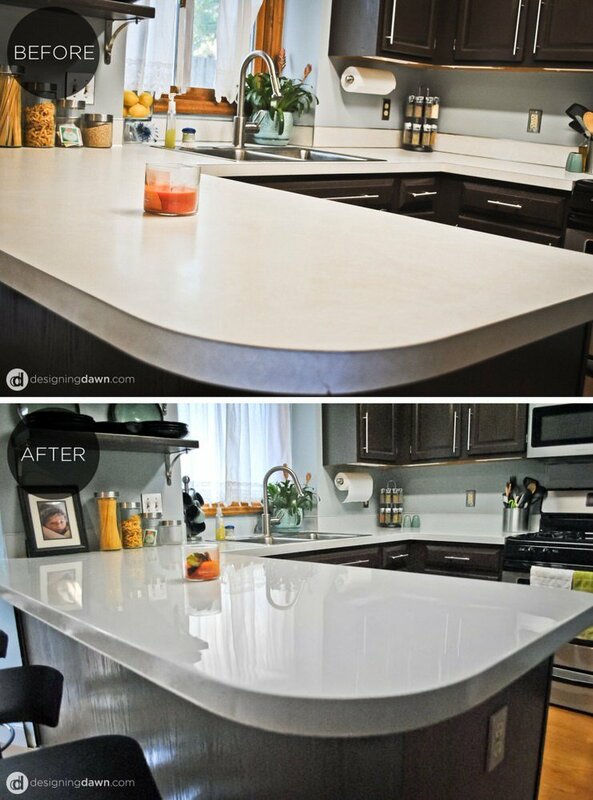 Dawn from ‘Designing Dawn‘ has transformed her kitchen into something really chic with these DIY glossy painted counters! I love the soft gray she chose too, gave it a modern vibe without being cold. Plus, she tells you about a product to seal it with that is supposed to be food safe. I. Am. Tempted. Update : My daughter and her husband brought a house with Harvest Gold countertops. Yep. So until they could afford to upgrade, they used this technique! It looked great! 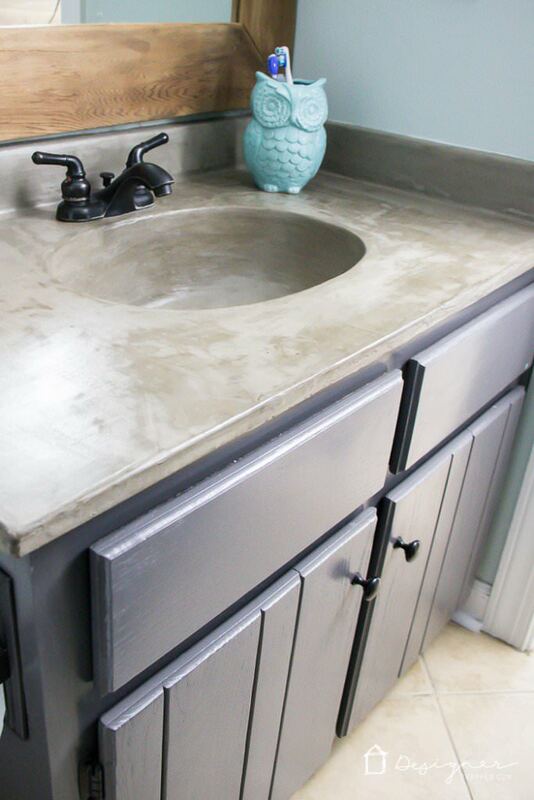 Our friend Tasha over at ‘Designer Trapped‘ shows us how to update an old counter with this amazing DIY concrete countertop! She even shows you all the supplies and where to get them! 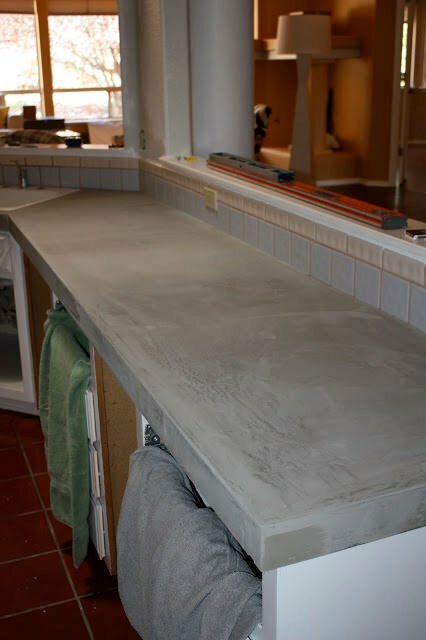 I love industrial style in the kitchen, so these DIY concrete counters are an amazing project. They are also laid right over existing, old ceramic tile. Love the idea of not having to demolish or remove anything. From ‘Design Stocker’. ‘DIY Network‘ has a totally different take on their technique for installing a concrete DIY countertop… Step by step instructions. 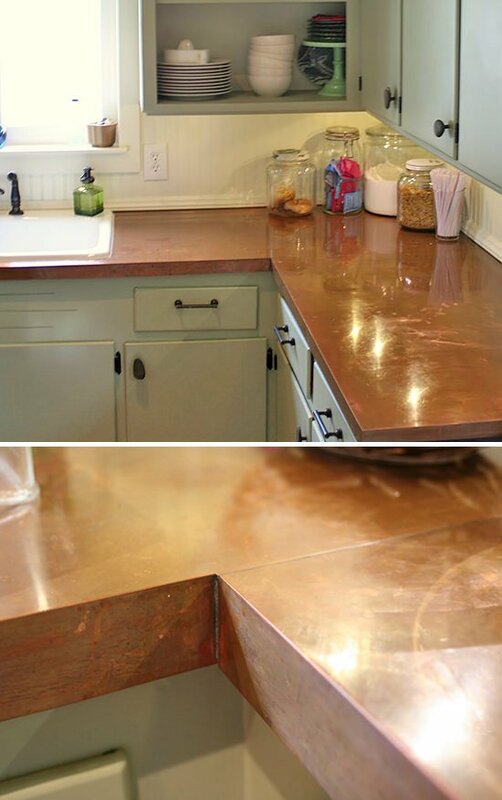 Merrilee from ‘Lilliedale‘ has a tutorial for these copper DIY countertops that looks like such a daunting project… but she makes it look totally doable! And wow! These are not boring builder countertops! 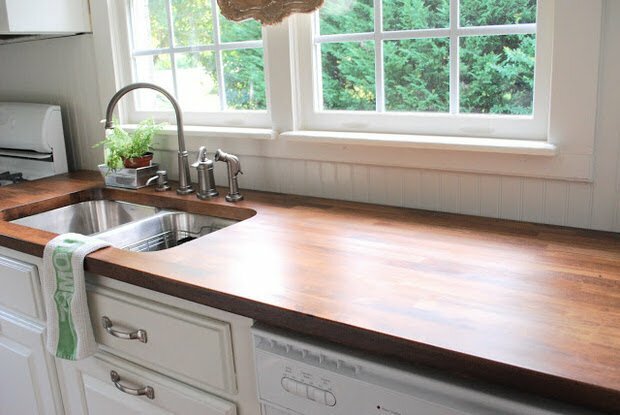 From ‘Chris Loves Julia‘, read how they installed their black walnut craft art DIY countertops… These are so pretty, I can’t even imagine the feel that they give their kitchen… I love natural things like wood and stone. 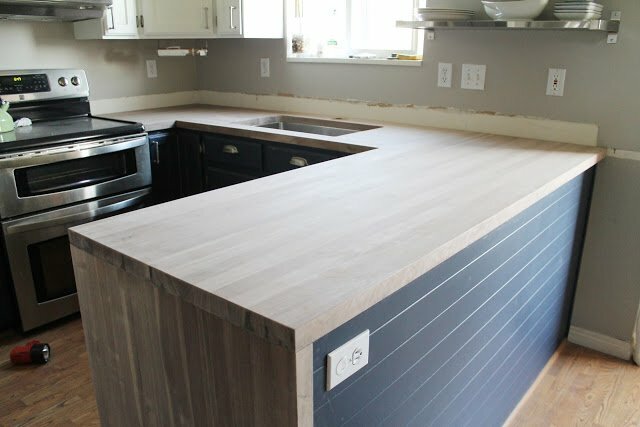 Finally, learn how to install butcher block DIY countertops by ‘This and That‘… long post, but it’s because there is such great info and lots of photos. We are so excited about these DIY countertop ideas & projects! We think you will also love our posts on DIY Painted Countertops and DIY Kitchen Islands! Next Post 10 Easy Organized Pantry Ideas!